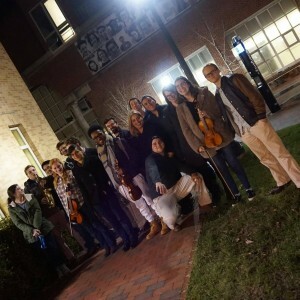 Charanga Carolina is the only university-based Cuban Charanga ensemble in the state of North Carolina and in the country. The Cuban “Charanga” ensemble features flute, violins, brass, piano, bass, and Latin percussion. It is traditionally associated with danzón, a musical and dance style with roots in European light classical and Afro-Cuban music. The Charanga also played a central role in the development of salsa music in the 1960s and 1970s in New York City and continues to play an important part in contemporary Cuban and Latin dance music. UNC’s Charanga Carolina specializes in Cuban danzón, contemporary Cuban salsa, New York-style salsa and occasionally performs other Latin American music styles such as merengue, bomba, bossa nova, and tango. The ensemble is committed to bringing these important musical repertories in the history of Latin American dance music to life for Carolina students, faculty, and staff and our surrounding communities. Charanga Carolina can be taken for one credit hour and is open to all Carolina undergraduate and graduate students, regardless of your major. Students are required to have strong music reading skills and proficiency on your instrument, but experience playing Latin music is not required. Auditions will be held during the first rehearsal (Tuesday) of the semester. To pass the audition, students must demonstrate strong reading skills, pitch and rhythmic accuracy, and proficiency on their instrument. Students are expected to attend all rehearsals, sectionals (scheduled as needed), and performances. Charanga Carolina (MUSC 212) meets the B.A. in Music’s and BMus’s Global Music and ensemble requirements. Rehearsals are scheduled for Tuesdays, 8:00-10:00pm in Kenan Rehearsal Room (KMB1201) and occasionally in the World Music Room. For more information please contact David Garcia, Director, at daga@email.unc.edu.